Welcome to Pettit Place, a southern contemporary custom home, built right in the center of downtown Lexington. 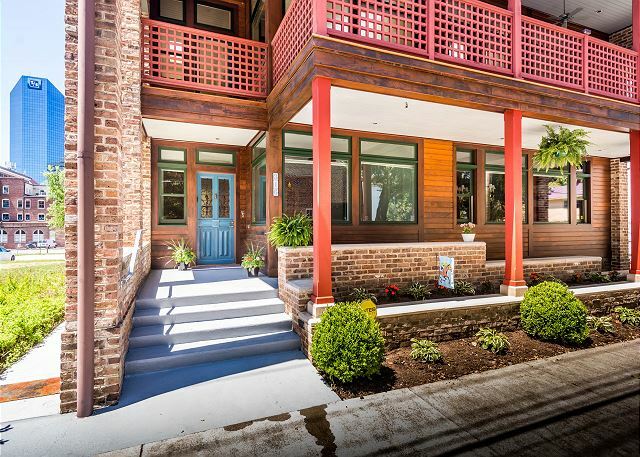 Completed in 2005, this property is a 2-story, one of a kind home spanning nearly 4,500 square feet with an elegant downtown vibe that still exudes classic Lexingtonian style. Beautiful natural light accents the open floor plan that offers space for a large group to spread out and stay comfortably. 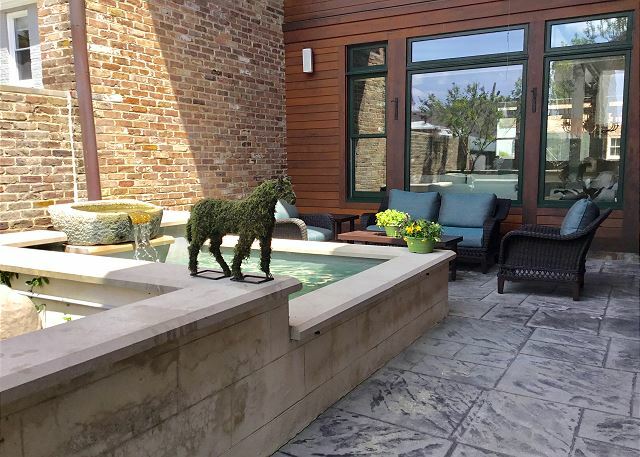 The home has 10-20 ft ceilings throughout, 3 private porches, an outdoor water feature in the private courtyard, sky line views of downtown to the back and views of the historic Hunt-Morgan house and gardens out the front picture windows! It can sleep up to 12 and has an elevator for accessing the second floor. A private garage and secured outdoor driveway (enclosed inside electric gates) offer parking for 4 cars. The property was home to a former mayor of Lexington and was designed by his son, Van Meter Pettit. The Pettit family recently decided to open it to guests to share a bit of authentic Lexington with visitors to the city! There is 1 master bedroom on the ground floor with a King size bed and en suite bathroom that has a soaking tub/shower combination. This bedroom has a TV and views out to the courtyard. The second floor has an additional master bedroom with a King size bed, 2 en suite baths (one with a tub and one with a shower) and picture windows along the front of the house with a door to access the front porch/balcony. There is a study located outside this bedroom and another door for accessing the porch. There is a guest bedroom with a queen size bed on the second floor as well as the "loft" bedroom, which has 2 sets of twin over full bunk beds and a sleeper sofa (it is a huge room!). These two guest rooms share a bathroom with shower/tub combination that has jack and jill doors offering an en suite experience to the queen bedroom and hallway access for those staying in the loft bedroom. The queen bedroom has a private porch overlooking the courtyard. The loft bedroom has a TV. We had a group of 8 and it was a perfect space. I could live here. An architectural masterpiece in historic neighborhood within walking distance of great restaurants. Near Mary Todd Lincoln and Hunt Morgan home tours. Perfect open but cozy indoor outdoor spaces. 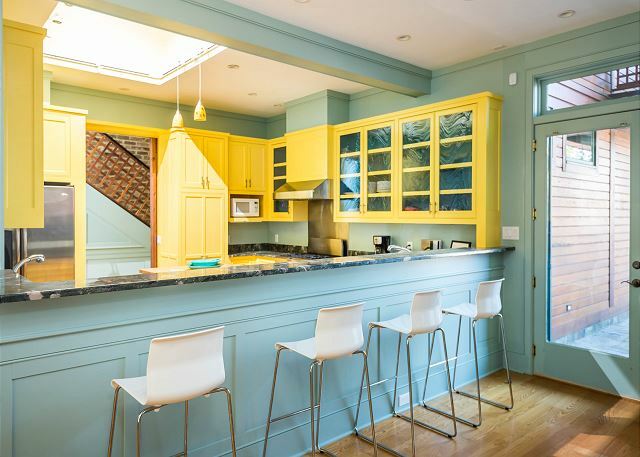 Woodwork, built ins, colors, a joy. Thank you, Karen! Pettit Place is a unique home with the best location in Lexington! We are so glad you had a wonderful trip. Hope to host you again in the future! We loved our stay at Pettit Place! Our group of friends traveled to Lexington for a basketball game. The house was spacious enough for all our guests, great location to walk to everything downtown and beautiful! Would absolutely stay here again! There was a little difficulty accessing the rental- but verbiage in the instructions has already been changed to avoid the confusion we had for the future. They advertise 4 spaces with this house, but in actuality there are only 2. The property manager does have alternate spaces if other units are not rented. The table only seats 8 and there are only place settings for 11 guests even though the unit sleeps 12. Overall, we had a great stay. Despite the confusion, the property management was quick to respond and assist throughout our stay. It was a lovely house! We are sorry for the confusion around the number of parking spaces on site - the driveway and garage are best with only 2 cars but we do offer parking passes to park across the street regardless of whether the other home is rented. The property can accommodate 4 cars, just not all on site in the gated garage! We enjoyed our stay at Pettit Place. Walking distance to restaurants. Pet friendly with close areas for walking dogs. Spacious accommodations. Thank you, Cynthia! We're glad you had a wonderful time at Pettit Place and got to enjoy the convenient location of the home! See you next time you visit Lexington! Fantastic location and amazing home. Absolutely loved staying here with our big family. So nice to have a large family room and kitchen. We will be back! Thank you, Kate! So glad the whole family could stay under one roof! We look forward to hosting you again in the future! This an exquisite and unique property. Beautiful accommodations and tons of space for a larger group. Very conveniently located to the restaurants, coffee shops and bars downtown, all of which are easily within walking distance. Thank you, Mark! Pettit Place is the prime location for exploring downtown Lexington. Looking forward to hosting you in the future! Great Stay at Pettit Place! We had a fabulous stay in Lexington. Came for a wedding and this was the perfect spot for us to stay. 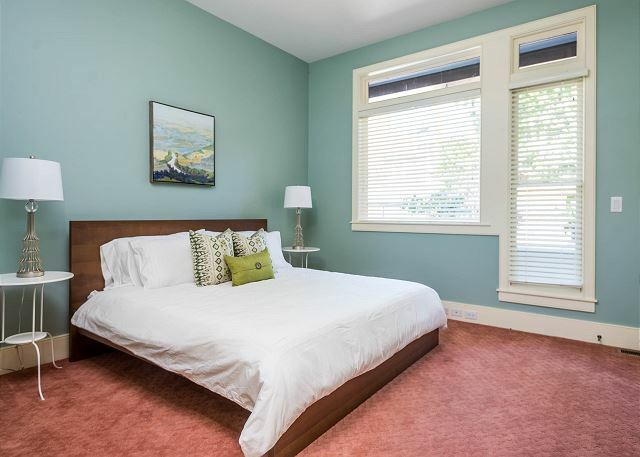 Beautiful house, close to downtown, tons of space, comfortable beds. We would come back again! Thank you so much, Erin! Pettit Place is extremely spacious and has the best location for exploring downtown LEX! We would love the opportunity to host you again in the future! We had a great time! House was amazing! Clean, and the property caretaker very friendly and helpful! So close to all the bars and restaurants! Thank you, Patricia! We're so happy you had a great time at Pettit Place. The location is ideal for spending time downtown! Hope to host you again in the future! We visited for Parents Weekend at UK and the UK v South Carolina Football Game ! GoCats! We have two families about 10 people in total. Everything was wonderful ; Lisa was extremely helpful and provided recommendations for eating and things to do. The location is second to none. Easy to walk downtown and a short ride (also walkable) to campus. Highly recommend this location. Thank you, Patrick! We're so glad that you took advantage of the excellent location and were able to explore Lexington by foot! Keep us in mind next time you visit the area, we would love the opportunity to host you again! Fantastic accommodations. Beautiful property. The outside courtyard was an unexpected surprise. Would absolutely stay here again.! Thank you, Rick! The courtyard at Pettit Place is the perfect spot for a morning cup of coffee and enjoying the beautiful weather in Lexington! We hope to host you again! Wonderful experience for us 4 couples. Very accommodating for the 8 of us. Kitchen and sitting area large enough for us to cook-in and enjoy our meals. Walking distance to downtown shops and restaurants. Easy drive to Keeneland. Thank you, Don! We're so happy you enjoyed your stay in Lexington! See you next time! We were a large group renting both Pettit Place and Aldridge House (right next door), and we sincerely enjoyed the open floor plan of the downstairs of Pettit Place, general comfort, and ease of walking downtown and to the University of Kentucky. We hope to be back next year! We attended a beautiful New Years Eve wedding and stayed at Pettit Place. This is the perfect place for a large family. My husband and I and our 3 grown children and their children stayed here and loved it! Large kitchen allowed multiple people to prepare food for adults or the children. Lots of room to move around and each family had room for privacy. Extremely clean and well maintained we have family in Lexington and will definitely do this again! It is a wonderful way to bond with your grown children and grandchildren and they get to know each other again! Pettit Place was the perfect house for a Christmas getaway for our family. There was plenty of room for our 8 family members and 2 dogs. The house is in a great location downtown, allowing us to walk to great dinner spots and several entertainment options. Our extended family stayed at Pettit Place for a UK Graduation in December 2017. You can really tell the difference between a house and an architect designed home. 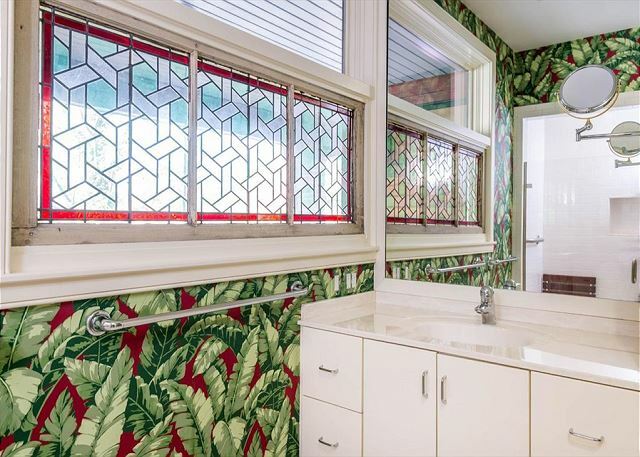 This home has every detail throughout. We had four families (12 adults total) and there was plenty of space, towels and bathrooms for all to share. I would definitely recommend Pettit Place to anyone visiting Lexington. My only concerns were the narrow garage doors, not quite large enough for a full size car or SUV. With no additional parking around the house (without hefty payments on UK game days) it made parking a challenge. But, you can fit four smaller/mid size cars in the available parking, so plan accordingly. Another concern is the lack of cooking utensils for a large group. There are plenty of place settings for the 12 of us. However, preparing food food for 12 in two eight- inch pans and no baking dishes was a challenge. Again, the home is fabulous and spacious. The setting can't be beat by any downtown venue. I have no regrets and I would definitely book it again. Pettit place is truly a unique and amazing property right in the heart of Downtown Lexington. The house was perfect for our group of 12 and we were all especially blown away by some of the house's subtle features (exposed brick, original window, vaulted ceilings etc). The property manager was very communicative throughout our stay and gave us great food recommendations as well. All in all, we had a fantastic stay. We were only in Lexington two nights (rented three but left early due to Hurricane Irma's wind and rain) but LOVED this property as well as its location. We had toddlers and grandparents and were able to take a short walk to most places we wanted to go. Lexington is a delightful town and this property was PERFECT for our needs. We can't wait to come back for a longer visit! One thing to note: I would call the management company rather than email them if you need anything. We weren't sure if we needed to strip the beds upon departure and didn't get an email response over the weekend. I'm sure calling would have been better though! We rented this home and one near to it for our business team, attending a conference just downtown at the Rupp Arena. It was perfect, large and open, great for group interactions. Lovely outdoor area even though in heart of downtown. Walking distance to everything.